We're seeing a lot more content these days than we used to. Today, so much content is generated by the media, our friends, colleagues and acquaintances that I don't think many people are aware that subconsciously we're ranking the available content based on trust. For example, if I go to Facebook and see a list of new postings on my timeline, I'm going to zoom in on the pictures of the friends I know well and trust before I zoom in on the post from some dude that I barely remember from school and if memory serves me correctly, was the class clown. The same thing happens with media. 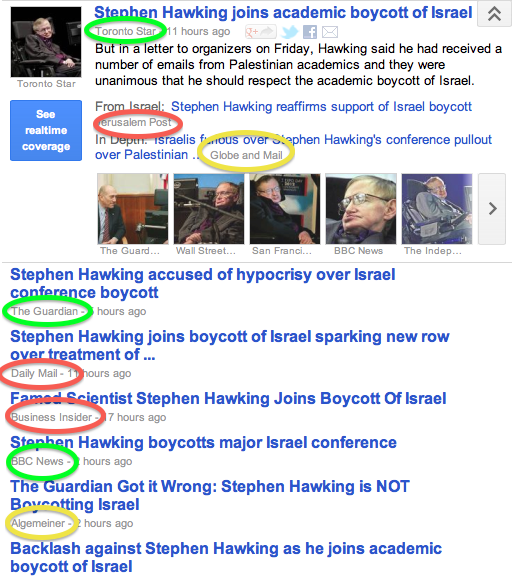 One of the top stories today is regarding the Stephen Hawking non-attendance of an Israeli conference. Now, there is much "content" but the first thing I do is rank my options by the media names I trust or recognise (shown here in Green), then go to the other names I know but take with a pinch of salt (shown in Yellow) and then finally I may or may not visit the red ones. What this shows to me is that "content is king" is wrong when you're drowning in content. The real phrase should be this: Trust is king. If you have a social media brand, the question you should be asking yourself is whether people trust you properly.